There are roughly two types of Japanese snacks. There is the loud, colorfully packaged stuff that is sold in consumer packaging. It is so shelf-stable that it'll likely survive the current administration's efforts to bring about a nuclear war. These are in contrast to delicate, classy, and unlikely to survive two months in your pantry treats that are beautifully packaged and often given as gifts. The first type are relatively easy to get your hands on as you can buy Japanese KitKats, umaibo, green tea, and, of course, Pocky, from Amazon easily. What Amazon may not sell you, eBay will or you can subscribe to a Japan box and get samples of such items. In fact, as this blog re-awakens, I will likely buy some of those subscription boxes myself both to test the value of the services and to review the included items. I hope to come at reviewing them from a unique perspective since I've had copious experience buying the types of items in the boxes in Tokyo and know the prices and selections well. The second type of item are far trickier to buy. I had thought that the only way to get them was to live close enough to a specialty shop that carried them or a market which sold an inferior shelf-stable consumer version of such items. There are other options, but they tend to be prohibitively expensive. However, thanks to some research, I learned there is a far more reasonably priced possibility. That is doing mail order from San Francisco's Nippon-ya shop. My first experience with Nippon-ya was when I lived in the Bay Area (which I hated and endured for three and a half years) and made several trips to "the city" (as the locals call it - if you want to really piss them off, call it "Frisco") to see what it had to offer. Besides a plethora of homeless people, human waste on the streets, and a lot of filthy, disintegrating areas interspersed with tidy, clean, tourist- and gentry-ready spots, it has a Japantown with a lot of cute and cool stores. During that initial visit, I picked up a mere two boxes of sweets because I was watching my wallet at the time. I still watch my wallet, especially in American cities because pickpocketing is a thing that is more likely to happen here than in Japan, but I can now indulge myself a bit more now and then. However, I no longer live within reasonable driving distance of San Francisco so I have a bit more money, but not the access. Fortunately, one of our Bay Area friends decided to visit us in our remote locale and happily agree to ferry some wagashi booty to me. Rather unfortunately, Nippon-ya has no online mailing system nor is their Facebook page meticulously updated about new or current stock. They do serve Japanese products and often Japanese people so the up side is that they are super helpful and polite on the phone. I called them and they took note of what I wanted and made recommendations and answered questions about their stock. Mainly, I asked about flavors and types of snacks and, with their verbal assistance on the phone, Yelp's photos of their stock, and their Facebook page content, I created a specific list of six boxes of goodies for my friend to deliver. You might wonder what good this information does for you since you are unlikely to have a Bay Area friend willing to drive to your place with boxes of manju or whatnot, especially if you live in Florida or Oklahoma. It's not that there is anything wrong with those places, but, yeah, there are things wrong with those places, but rather that it's an incredibly long drive. You're in luck because Nippon-ya will take orders by phone and ship to you via UPS. This matters to me, too, because I want to make another order (or many other orders) in the future and can't expect my friend to do the 10-hour round trip to see me when I want more bean cakes or daifuku. The display of chestnut daifuku when I was in the store several years ago. You can guess the season I was there from the selection. Also, I reviewed this on this blog. Some "classic" flavors tend to be available year-round. 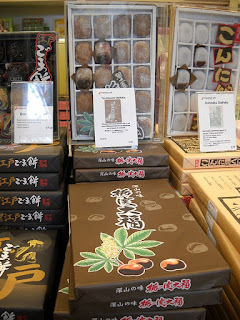 This mainly would be basic anko (bean paste) sweets including white, yellow, and red bean varieties of sweets that come in various wrappers (cake and mochi mainly). 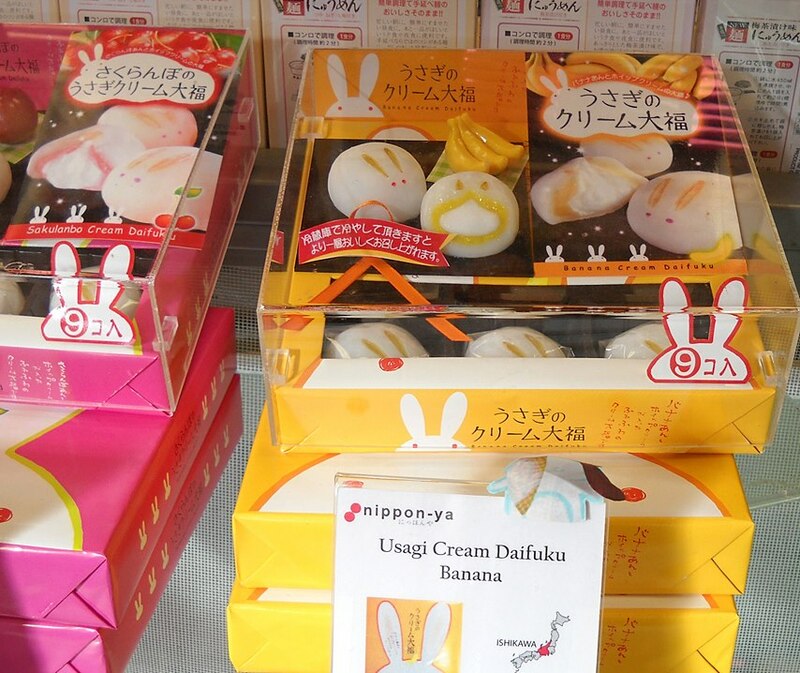 I was told that their "Harajuku Mochi" line is always available (though there are seasonal specialty flavors) and that Hina no Sudachi, which is the first item I'll be reviewing after this post, is also always available. Note that they also sell tea, various crackers, and cookies including gaufrettes. However, my orders will focus largely on non-European-derivative items as I want very "Japanese" items. I mention those options in case my readers have less specific interests. Shipping is based strictly on the actual weight of the items. The representative who I spoke with said that they will assemble your order, take it to the UPS outlet in the same mall as them, and give you an exact quote. I weighed my boxes when I got them and will be including weights with my review information any time I review items from Nippon-ya. My packages totalled 5.5 lbs. which would have cost me a little over $8 if my UPS standard shipping chart reading wasn't incorrect (though I am most likely off by the weight of the packing materials). My best guess is that 6-10 boxes are likely not to cost more than $15 to ship, but I can comment on that more in the future when I make an actual mail order. All in all, if they are true to their word about charging only what the weight of the packages require, you should be paying less than $2 per box in cases of larger orders (3-4 or more boxes) to have the sweets sent (depending on the item's size). Of course, you will always get better value from the shipping with larger orders. If you buy one box, you're likely to be paying a heavy premium for shipping. Beyond the shipping costs, there is, of course, the matter of the items themselves. Most of them cost between $9 and $16 per box. The prices are incredibly reasonable and many of them are not much more expensive than what you'd pay in Japan. The "Harajuku Mochi" is $9 for a 16-piece box. The pieces are small, but that's a very good price compared to Japanese markets in the U.S. The Hina no Sudachi, which is one the of the biggest and heaviest items as the cakes are bigger than standard mochi sweets, includes 15 pieces and is $15. Again, this is not too far off of prices I'd expect to pay in Tokyo for a similar sweet in a standard shop. That being said, you could likely get cheaper options at places like Niki no Kashi (a discount sweets shop in Ueno), but most of us aren't in a position to hop a train and head to Ueno. The price of a plane ticket would make even discount sweets less than a bargain. My best guess is buying these types of items (though not these exact ones) would cost between $6-$12 in a discount shop. So, if you're actually in Japan, these may still seem pricey to you, but they seem very reasonable to me from where I am with my access and experience trying to buy in shops here in the U.S. So, unlike when I was reviewing before and buying in Tokyo, my readers should be able to get their hands on whatever I am reviewing from now on. If the Nippon-ya items interest you, you can contact them either by Facebook messages or calling them. They are very helpful and polite so you won't be disappointed. Also, if more people order from them by mail, I think they may eventually be incentivized to make a web mail order site and the process will get easier. Note: I am not endorsing Nippon-ya, and have no financial connection to them. I paid for my products and am talking about them here to offer information on a resource for readers.